Customer point of sale display Malaysia, available as pole display or desktop models can provide price or cost information as well as advertising to a customer at the POS. Partnertech display Malaysia might include LCD display or multi-line fluorescent that connects to the system by a parallel, serial or USB connection. Make it so easy for you and your customers to follow every transaction with the perfect customer display. Pole displays are considered as customer displays, show products, and price detail to the customer. They are typical in check out counter and fast food establishments. The majority of pole displays depend on from one to 3 lines of display and promote advertising. How do Point of Sale Pole Display Work? Pole displays are utilized to show the customer the cash register purchase information. This item receives data from the Point of Sale software operating on the connected computer and decodes it for the customer. The majority of display advertising posts, depending on the capabilities of the POS system software. You will find some crucial factors to consider when deciding which pole display you must buy. These factors will include connection interfaces, software requirements and emulation, style and aesthetic too. Whenever choosing a pole display, it is essential to know what emulation your POS software support. Emulation is simply the procedure of utilizing a computer program to mimic the activity of a piece of hardware. The majority of pole displays will link to your computer through a USB connection or a serial, while there are some models that can connect straight to the receipt printer. Generally, serial interfaces were the industry standard, however, most pole displays have their own USB connectivity options. On the other hand, there are some considerations when we talk about pole display for the POS environment naming display, mounting style, size and color features. Common colors options are beige, white and black. You must choose a color, which fits your POS equipment and environment. The line up of counter display that RedZone provides is made with compatibility and reliability. Even through fully compatible with many systems, our customer display is made to fit our POS mobile and terminal solutions, offering you the easiness of a one-stop-shop along with the advantage of one contact for full support. 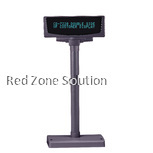 Compatibility and reliability are the core value of RedZone’s wide range of POS display. We offer all the peripherals to complete the hardware needs for any customer service system or POS. Peripherals, which we can offer to you include VFD customer displays, receipt printers both fixed and mobile location, programmable keywords, cash drawers and service caller systems. Even though fully compatible along with different systems, our displays are ideally matched to our POS or mobile solutions offering you the ease of a one-stop-shop along with the advantage of a one contact point for support. If you are looking for a retail display for a reasonable price, RedZone can offer you with the best products.